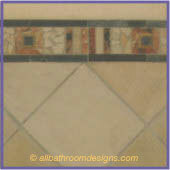 Your bathroom floor tile should make its own design statement and reflect your style. 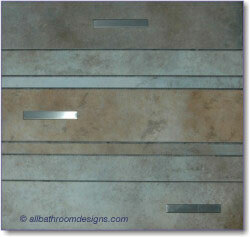 Let's take a look at how even standard tiles can be transformed with metallic inlays. 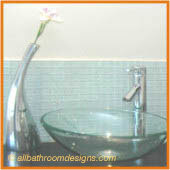 You could use one color throughout or take it a step further and use different shades from a family of bathroom tiles. Cut them into uneven strips to create bathroom tile designs that are uniquely yours. When using these designer strips to create a border pattern in your bathroom, do make a drawing of your bathroom floor plan first. Do the drawing to scale! Scan and print a couple of copies and start playing around on paper. 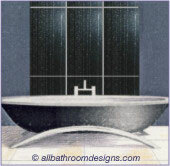 Refer to our Bathroom Layouts page for printable graph paper and sample fixtures. 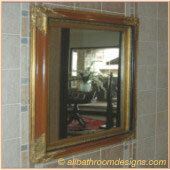 Don't be tempted to create a border around all the fixtures. Their placement is often - in fact mostly - determined by plumbing/space requirements and not aesthetic considerations. 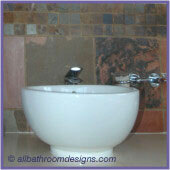 Plus, a toilet base is not the easiest or most pleasing shape to work with either. Too many patterns on the floor will be distracting too, which is not the aim here. Do let the pattern be interrupted (when passing through or behind a toilet, bidet or basin pedestal - the eye will follow the line through the "interruption" and complete the pattern. With a smaller bathroom, you can simply follow the outer edges of the floor (where it meets the walls). This will draw the eye outwards and visually enlarge the floor space - a good idea especially where fixtures are off the floor. 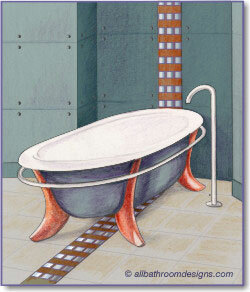 For example: wall mounted basins and toilet and a freestanding bath. Not a good idea where there is very little floor visible against the walls. In a larger bathroom there is obviously more floor area to play with and you can also consider creating an island area with your unique bathroom tile designs. Design Note: If you are using designer tiles as a feature on the wall(s), consider leaving the floor less detailed and vice versa, lest they vie too much for attention and detract from one another. You can also use bathroom floor tile patterns to lead the eye to focal areas: A designer bathroom vanity, beautiful bathtub or entrance to a shower. You can be bold too! Use your small insets to create a large eye catching pattern. Place them in a guiding pattern to lead the eye to areas that you want to showcase. Design Note: If you repeat the motif of the tile inlay in another element, such as your designer vanity, mirror frames or etched pattern on the shower door etc., it greatly adds to the overall design effect. Head on over to our page where we show exquisite bathroom tile designs for bathroom walls for more custom ideas and inspiration.